The pink suffusion found on some gulls is considerably different than known color abnormalities such as albinism, leucism and melanism. This pink flush is said to be diet-related and is not permanent, changing in intensity from season to season, and sometimes within the same plumage (McGraw, Hardy 2005). At least 13 species of gulls are known to show this pink coloration to varying degrees. Some species rarely or never show it, whereas a few, such as Ross's and Franklin's, almost always show some trace of pink. Adult Ross's Gull showing obvious pink tones on underparts . Cherry Creek Reservoir, CO. 21 NOV 2010. The earlier literature suggested that this pink coloration was a result of red preen oil containing carotenoids that were applied to the feathers via preening (Stegmann, 1956). Grant also used this explanation in his identification guide but this explanation overlooks the fact that some white-headed gulls (such as Ring-billeds) show this coloration on parts of the head that are impossible to reach with the bill while preening. Adult Ring-billed showing uniform pink coloration all throughout. Tinley Park, IL. 11 March 2012. It's now thought that the carotenoid "astaxanthin" is responsible for the pink feathers we see in gulls (McGraw, Hardy 2005). What isn't very clear is why some individuals within the same species or same population show these pink suffusions and some don't. It's thought that some may have "sufficient access" to or "sufficiently utilize" these carotenoids. That is, some individuals find food sources that provide sufficient amounts of astaxanthin, or, physiologically, some individuals are able to accumulate and/or produce this carotenoid. 1st Summer Little Gull. Sheboygan, WI. May 2013. As a rule, the smaller tern-like gulls are much more likely to display pink hues than the larger gulls. Adult Little Gull with pink cast on underparts. Carlyle Lake, IL. 21 January 2012. Photo courtesy of Dan Kassebaum. Most interesting is Hardy's suggestion that as of 1998, more and more Ring-billeds (up to 30%) in the Pacific Northwest have been found with traces of pink in their plumes. This was two years after salmon hatcheries in Washington state began providing synthetic astaxanthin as a diet supplement to their young fish. A natural question I've asked is why Mew and Glaucous-winged Gulls don't show these pink tones. I don't know of any gull species that consumes more salmon than Glaucous-wingeds - this species thrives on the spawning streams of salmon all throughout the Pacific Northwest. Could it be Glaucous-wingeds (and Mews) don't sufficiently accumulate, utilize and/or produce these carotenoids? 2nd cycle FRGU. Chicago, IL. 25 March 2011. When I first found this individual standing by itself on the beach, the deep pink hues were what first caught my attention. When it got up and began flying, the overexposed pink on the underparts was almost instantly diminished. 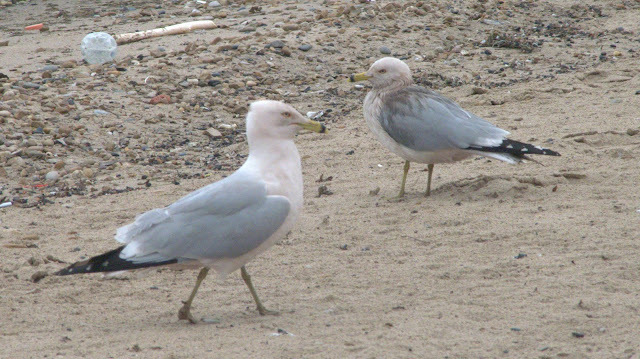 As for the implications this pink coloration has within conspecifics, McGraw and Hardy suggest the following, "Because carotenoid colors often are sexually selected indicators of mate quality in adult birds, there may be signaling benefits to producing pink plumage in these gull species". Although this may hold with Ross's and Franklin's Gulls, I've found that Ring-billeds with pink tones are at the bottom of the feeding hierarchy and they seem to be slight social outcasts among their flocks. White and "pink" adult Ring-billeds. Oak Forest, IL. 27 March 2012. These "pink" individuals almost always seem to be more dirty and untidy, giving me the impression that it's difficult to remove dirt from their feathers via bathing and preening. Do these feathers possess an adhesive-like property? That would indeed be disadvantageous to any bird. Tentatively, I suspect the pink found on Ring-billeds, at least outwardly, is sufficiently "different" than what is observed on Ross's and Franklin's. "Pink" adult Ring-billed. Chicago, IL. 24 April 2010. What happened to the bird in the back? I would add that these "pink" Ring-billeds appear most intense at the onset of the breeding season and almost never in the winter season. This has also been my experience with Franklin's Gull. Is it possible that the carotenoid "astaxanthin" is hormonally induced? Carolyn Marsh and I were recently discussing the increase in Ring-billeds exhibiting an exaggerated amount of pink feathers and she feels a steel factory in East Chicago, where now sits the largest Ring-billed colony on southern Lake Michigan, might be the cause. Her unverified thoughts on this is that some type of iron deposit or chemical is acting as an external dye in the water. I have a very strong impression that these birds have been subjected to ore dust that they nest near. Calumet Park. Chicago, IL; 14 April 2012. Although more is known about this colorant now than just one decade ago, there are still many questions that remain to be answered. I'd appreciate learning about your experiences and observations with these "pink" gulls.